This package provides tools through which you can change the encoding, font, and/or script of text in Microsoft Word and other Office documents, XML documents, and SFM text and lexicon documents. It also installs a system-wide repository to manage your encoding converters and transliterators (TECkit, CC, ICU, Perl, or Python based, as well as support for adding custom transduction engines). For developers, it provides a simple COM interface to select and use a converter from the repository. It is easy to use from VBA, C++, C#, Perl, Python or any .NET/COM enabled language. This package is fully integrated with SIL FieldWorks, AdaptIt, and the forthcoming Speech Analyzer 3.0 and Phonology Assistant 3.0 software, providing the same system-wide registry of installed and available encoding converters for all of these user programs. Additionally the package includes some extra utilities such as a clipboard converter for manipulating text between cut and paste operations. SILConverters 2.6 corresponds to the same version of the core EncConverters assembly as Fieldworks 4.2 and Speech Analyzer 3.0 and Phonology Assistant 3.0. The new 2.6.1 version of SILConverters corresponds to the same version of the core EncConverters assembly as Fieldworks 4.9 and 5.0, Speech Analyzer 3.0.1 and early test versions of Phonology Assistant 3.0. Bulk Word document converter — Use this application to convert one or more Word documents using converters from the system repository. Though it has similar functionality to the Data Conversion Macro, this tool is used outside of the Microsoft Word environment and can be used on multiple documents at the same time. It is also recommended for documents that have very complex formatting, which the Data Conversion Macro occasionally has difficulty converting correctly. SILConverters for Office — This Office add-in gives EncConverters support in Microsoft Publisher, Excel, and Access. This application requires the Microsoft Word Primary Interop Assemblies (PIAs) to be installed. These can only be installed either from your Microsoft Office/Word 2003/2007 CD/DVD or from a 4MB download available from the Microsoft website and only if you have Microsoft Word 2003/2007 installed on your machine. On some machines, these assemblies will automatically be installed the first time they are requested, so you can try the program first to see if this is the case for your computer. However, if the program crashes, see the FAQ page here, for details on installing the Office Primary Interop Assemblies via one of the other two methods. Discourse Chart Builder — This application helps you prepare discourse analysis charts to study discourse features of a vernacular language text. It uses Adapt It for glossing. AdaptIt Target Word Guesser — This transducer can be used in an Adapt It adaptation project to guess target words based on the Source/Target word pairs in the Adapt It Knowledge Base. Please note that the installation procedure for SIL Converters as of version 2.5 is completely different from the old EncCnvtrs. SIL Encoding Converters 2.6 Setup—Conversion applications are installed and conversion Maps and Tables are copied to your hard drive. 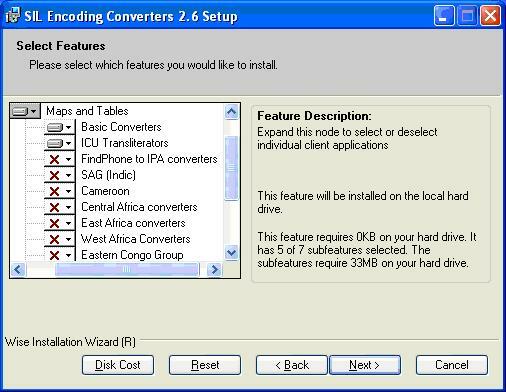 Converter Installer—A utility that allows you to activate the conversion Maps and Tables you want to use. Full installation instructions can be found here: SIL Converters 2.6 (and 2.6.1) Installation. This document is intended to guide you through the Master Installer installation screens and initial SIL Converters2.6 Setup. This guide may be sufficient for many users. However, to make full use of SIL Converters 2.6, you should download and refer to the SIL Converters 2.6 Documentation Help (download below). This document gives installation help. This is the same information that is found here: SIL Converters 2.6 (and 2.6.1) Installation. This document gives information about how to use the different utilities and applications for different text transduction applications. This information is no longer available as a webpage. You must download it here. Use these installers unless you have FieldWorks 4.2, Speech Analyzer 3.0 or early test versions of Phonology Assistant 3.0. If you have any of these application versions, use the SIL Converteres 2.6 installers, below. A live internet connection is required for this installer. This web installer is recommended for users that only want certain core functionality (e.g. TECkit, CC, and perhaps the Data Conversion Macro) and who do not have a good internet connection. This ‘on-demand’ installer will then only install the components you select; potentially reducing the total download size compared with the other two installer options below. This web installer (you must have a live internet connection!) will lead you through the installation process. If you do not have .NET or other addins it will guide you through installing those as well. Use the Installation Guide to help you through the process. MD5 hash: 988ea34478d5862033cbdb862bb0a2f3 This contains the same files as the above SIL Converters 2.6.1 package only (no addons) for offline installation (EXE file). It is provided for those who cannot download an EXE. MD5 hash: 8b813b54a76218705dd268fe9cde1622 This contains the same files as the above SIL Converters 2.6.1 Standalone installer (includes addons like .NET) for offline installation (EXE file). It is provided for those who cannot download an EXE. MD5 hash: 7641a37d659ff76a139fb02fc4d68503 This contains the same files as the above SIL Converters 2.6 package only (no addons) for offline installation (EXE file). It is provided for those who cannot download an EXE. MD5 hash: 8dba9215c346820f29277c369ecb2f6f This contains the same files as the above SIL Converters 2.6 Standalone installer (includes addons like .NET) for offline installation (EXE file). It is provided for those who cannot download an EXE. This installer includes the AdaptIt2Unicode converter program which allows you to convert Adapt It Legacy ("Regular") projects to Unicode with converters from the system repository. This installer requires SILConverters 2.6 to be installed. ConvertText.dot Like DataConversion.dot, this contains a Word macro for running converters on Word documents. The user interface is in French (but can also be run in English), and this macro does not delete footnotes and picture objects in a Word document. This section describes the encodings, font names, and converters contained in the different Maps and Tables packages available in the SILConverters 2.6 installer. You can check below for the fonts/encodings that you are interested in to see which Maps and Tables package to install. Use the SILConverters installer to install the package(s) of converter likely to be useful to you (e.g. based on your entity). During installation, all the converter maps/tables in the selected package(s) will be installed into a fixed location on your computer (i.e. 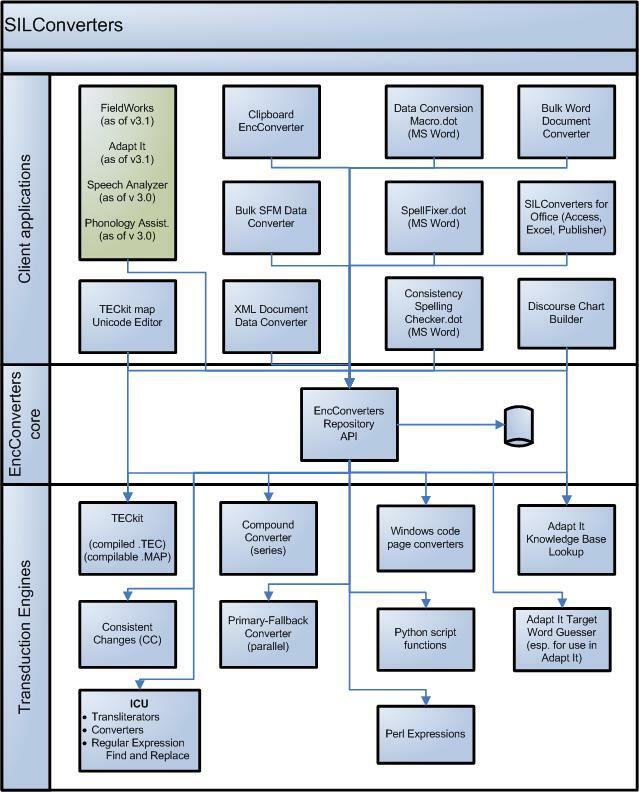 C:Documents and SettingsAll UsersApplication ataSILSILConverters22MapsTables). Use the Converter Installer application to install the few applications you want into the EncConverters’ repository. Installing maps and tables onto your computer with the SILConverters installer (step 1 above) will not make them available to SILConverters client applications unless you explicitly add them to the system repository using the Converter Installer or some other mechanism (see Adding Converters to the System Repository in the Help for SILConverters 2.6 document). All of the converters for these fonts are based on the core transducer Font2Iscii available from the website, http://www.iiit.net/ltrc/FC-1.0/fc.html. If there are problems with these converters, please contact that website for help.